Have you ever considered making your own homemade pizza dough when you are planning for a pizza night supper? 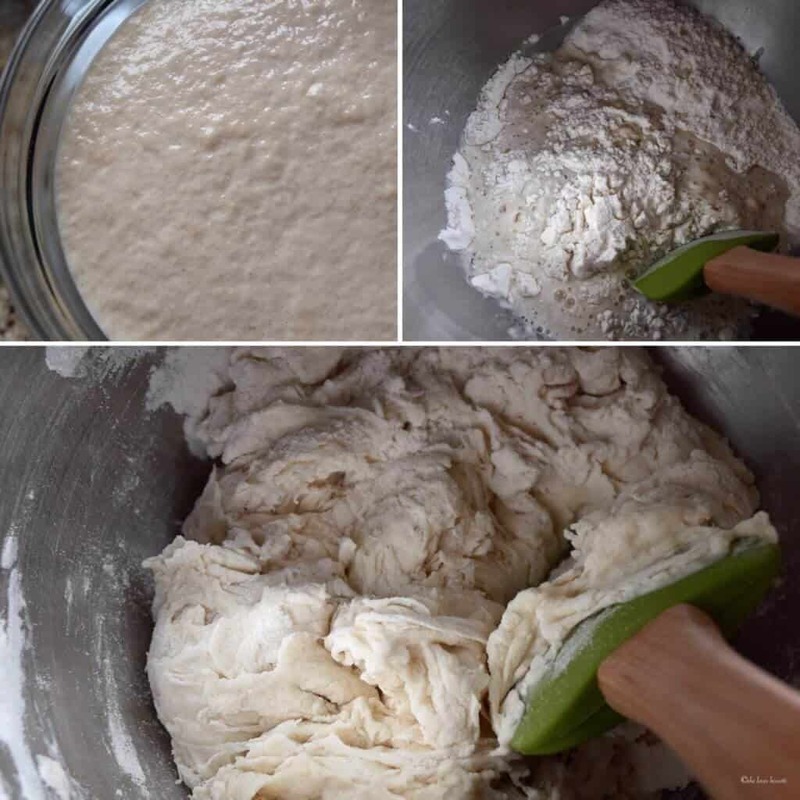 It is a lot easier than you think, especially if using this Easy Homemade Pizza Dough Recipe di Angela. In fact, it only takes about twenty minutes to make the actual ball of pizza dough. Fresh yeast: Can also be referred to as compressed or cake yeast. This type of yeast will only keep for about 2 weeks in the refrigerator. It needs to be “proofed” in lukewarm water that is between 80 °F and 90°F, without needing a source of energy (usually sugar). Instant yeast: There is no need to proof these yeast granules. Just whisk the yeast with your flour and the water and the rest of the ingredients and you are good to go. Active dry yeast: In order for this yeast to become “active”, it needs to be “proofed”. In other words, when we are proofing the yeast, we are testing to make sure the yeast is alive. In order to determine if the active dry yeast is indeed alive, it needs a source of energy (usually sugar); and the proper environment (usually provided by warm water). Within 5-10 minutes, there should be a flurry of activity as the yeast is activated. If there is no activity, you should probably start over with another batch of active dry yeast. Any one of these yeasts will work to make your homemade pizza dough. Special note about the temperature of the yeast: Yeast is extremely sensitive to the temperature of the water, so if using active dry yeast, you should have a thermometer reading between 110 °F and 115 °F. Personally, I prefer the convenience of using active dry yeast. 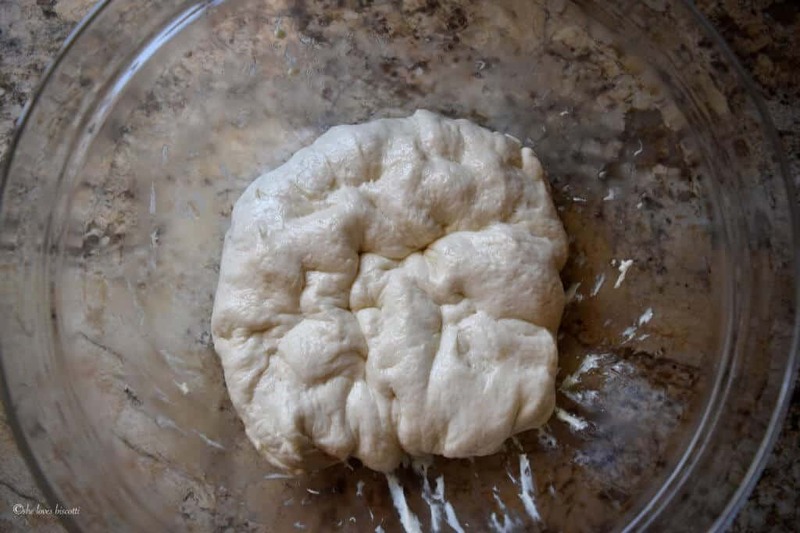 So when making this Easy Homemade Pizza Dough Recipe, I will measure the yeast, sugar and lukewarm water in a bowl and let it proof for about 5-10 minutes. Meanwhile, I will sift the flour in the bowl of my stand mixer. When the yeast mixture is ready, I will add it to the flour and start incorporating the two together. I will then add the salt and the olive oil, and continue to stir it together. As you can see, our homemade pizza dough has a “ragged” look. You can attach the dough hook and let the stand mixture do all the work for about 5-6 minutes. You will notice that the dough pulls away from the sides of the mixing bowl when done. No stand mixture? 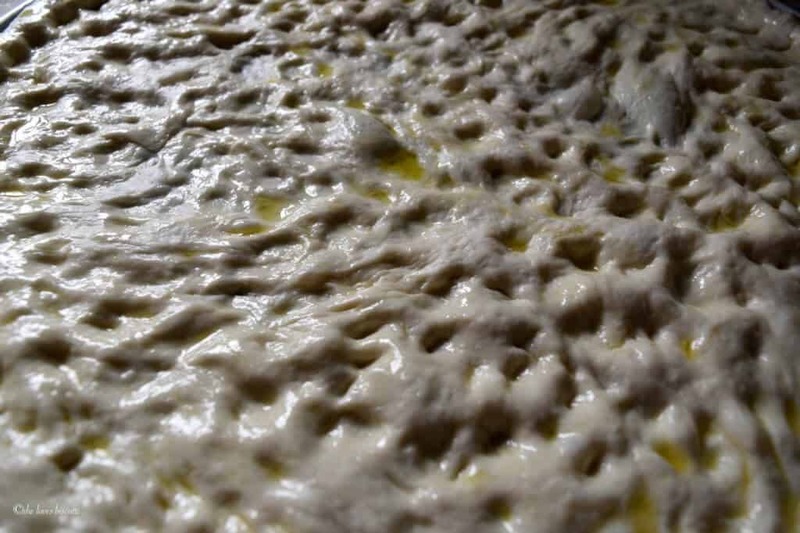 No problem, transfer your homemade pizza dough to a lightly floured board and knead the dough for a few minutes until all the flour is incorporated and the dough is soft. Dust your ball of pizza dough generously with flour. Place the ball of pizza dough in a plastic bag and refrigerate overnight. You might be surprised to learn that the pizza dough will almost double in size so make sure the bag is big enough to allow for some growth (please note that pizza dough balls can also be frozen for up to one month). The next day, remove the bag of pizza dough from the refrigerator about 15-20 minutes before planning to shape your pizza. Set your oven to the highest temperature… mine is at 500ºF. Make sure the oven stays at this temperature for at least thirty minutes before baking your pizza. While you are waiting, prepare your pizza pan by drizzling about a teaspoon of olive oil and spreading it out on the entire surface of the pan. My round pizza pan measures 15 inches. You can also make 2 smaller 10 inch pizzas. Drizzle about one tablespoon or so of olive oil in a small bowl. This will be used to dip your finger tips to spread the dough onto your pizza pan. This method will provide a pizza that has a soft and light texture. Transfer the ball of pizza dough from the bag to your pizza pan. Dip your fingers in the olive oil and begin to push and gently poke at the dough, stretching it as you go along. Remember to dip your fingers in the olive oil as you are “pushing” the dough into place. When you are finished, there should be a nice gleam to your pizza. While the oven is heating up, you can prepare your favorite topping. I will be posting one of my favorite toppings next week-end… stay tuned! POST UPDATE: Recipe can be found by clicking on this link: Best Homemade Italian Pizza di Angela. So, if you are planning to make a pizza the same day you have made your homemade pizza dough, we need to backtrack a little… while the stand mixture is kneading the dough, put a small pot of water to boil; place one oven grate such that it is touching the bottom of the oven and place the other oven grate in the top third of the oven. I will also turn the oven on to the “warm” setting. If you do not have this setting, turn on your oven to the lowest degree for just a few minutes. Once the water is boiling, place the pot of boiling water in the oven, off to the side and then turn the oven off. Let me explain this somewhat strange method I’ve adopted… I read somewhere a long time ago, that by creating the perfect chamber of humidity and heat, you will be rewarded with a wonderful pizza, once it is cooked. What can I say, I’ve done stranger things… and by the way, this works for me. So, back to the pizza dough. While the dough is being kneaded by the stand mixture, I will drizzle about one tablespoon of olive oil in a large glass bowl. With your finger tips or a pastry brush, spread the olive oil on the bottom and the sides of the bowl. So, by now, your well kneaded ball of homemade pizza dough is ready for the next step. 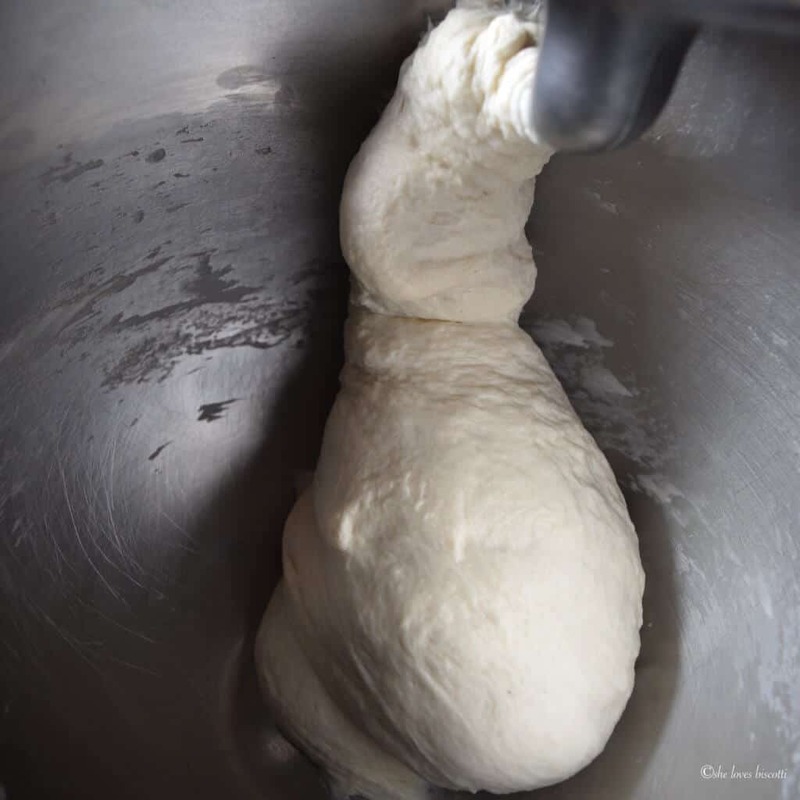 Gather the ball of pizza dough, place it in the greased bowl, making sure to turn it over so that the entire surface of pizza dough has a coating of olive oil. Cover the bowl with plastic wrap, and cover with a damp, clean tea towel. Place in the oven and allow to rise until double in size, about 35-40 minutes. Once the pizza dough has doubled in size, remove the bowl from the oven and punch down the dough. Let it rest for a few minutes. In the meanwhile, prepare your pizza pan by drizzling about a teaspoon of olive oil and spreading it out on the entire surface of the pan. My round pizza pan measures 15 inches. You can also make 2 smaller 8-inch (or even 10-inch) pizzas. Drizzle about one tablespoon or so of olive oil in a small bowl. This will be used to dip your finger tips to spread the dough onto your pizza pan. This method will provide a pizza that has a soft and light texture. You might be very disappointed to learn that there will be no flipping of this homemade pizza dough in the air, nor will there be any use of a rolling pin. Here is what I do: transfer the ball of pizza dough from the bowl to your pizza pan. 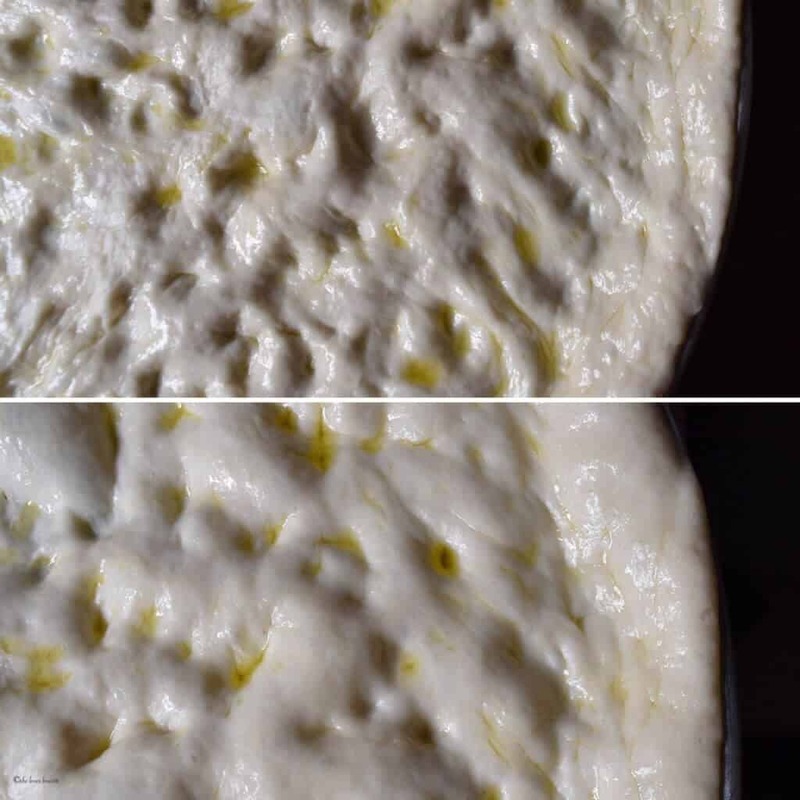 Dip your fingers in the olive oil and begin to push and gently poke at the dough, stretching it as you go along. Remember to dip your fingers in the olive oil as you are “pushing” the dough into place. When you are finished, there should be a nice gleam to your pizza. The pizza dough goes back in the oven for a second rising. This time about 20-30 minutes. Remember, this is not a thin crust pizza. So, while the pizza dough is “resting”, you can prepare your favorite topping. I will be posting one of my favorite toppings next week-end… stay tuned! Now it’s time to dress up your pizza. But first, set your oven to the highest temperature… mine is at 500°F. You can also now remove the pot of water from the oven. Make sure the oven stays at this temperature for at least thirty minutes before putting your pizza in. …and when the oven is ready, bake your “dressed up” pizza and in less than 10 minutes, you’ll have your very own homemade pizza! 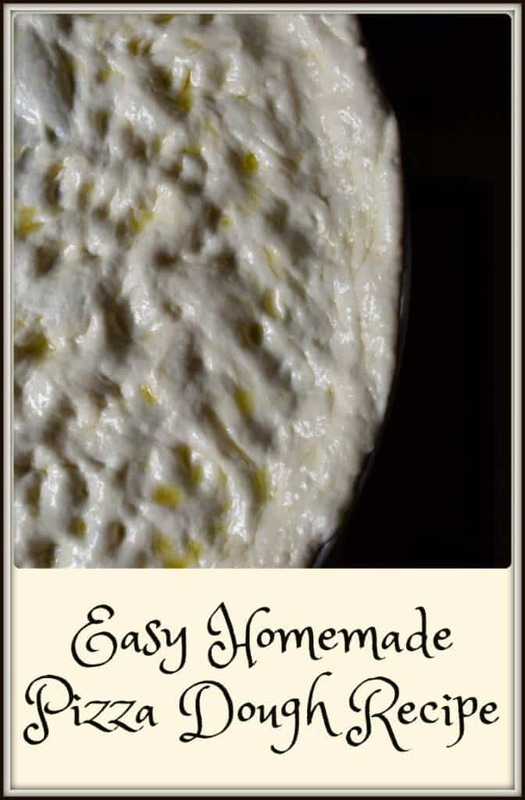 As you can well imagine, this Easy Homemade Pizza Dough Recipe di Angela was my mom’s recipe. Friday night was pizza night in our house growing up… I can still remember rushing home from school on Fridays because I wanted to help my mom make pizza. She would always wait for me. I had the all important job of adding the lukewarm water to the flour as she was kneading the dough. She always knew the right moment when there was enough liquid added to her flour. I guess that comes from years of experience making pizza at home. I was always in such awe that my mom could make pizza without a recipe and week after week, her pizza always turned out awesome! Next week-end, I will be sharing my mom’s pizza sauce and the recipe to make a simple pizza. So sign up by email in order not to miss the post. POST UPDATE: The recipe can be found by clicking on this link: Best Homemade Italian Pizza di Angela. Today, I shared my mom’s recipe for a homemade pizza dough that makes a crust that is crisp yet soft and chewy. A simple, homemade pizza dough recipe that can be made without the use of fancy equipment and special flour. This Easy Homemade Pizza Dough Recipe di Angela will provide you with the perfect crust for all of your favorite toppings. Have you ever considered making your own homemade pizza dough? It is easier than you think especially if using this family recipe for the best Pizza Dough. Measure the yeast, sugar and lukewarm water in a bowl and let it proof for about 5-10 minutes. Sift the flour in the bowl of a stand mixer. Add the yeast mixture and combine with a large wooden spoon. Add the salt and the olive oil, and continue to stir together. The dough will have a “ragged” look. Attach the dough hook and let the stand mixture do all the work for about 5-6 minutes. Dough pulls away from the sides of the mixing bowl when done. Alternatively, can be kneaded by hand. Dough can be refrigerated or used immediately (refer to explanation in text). Recipe can easily be doubled or even tripled if planning to freeze a big batch of dough. Divide in thirds. Freeze dough balls individually. 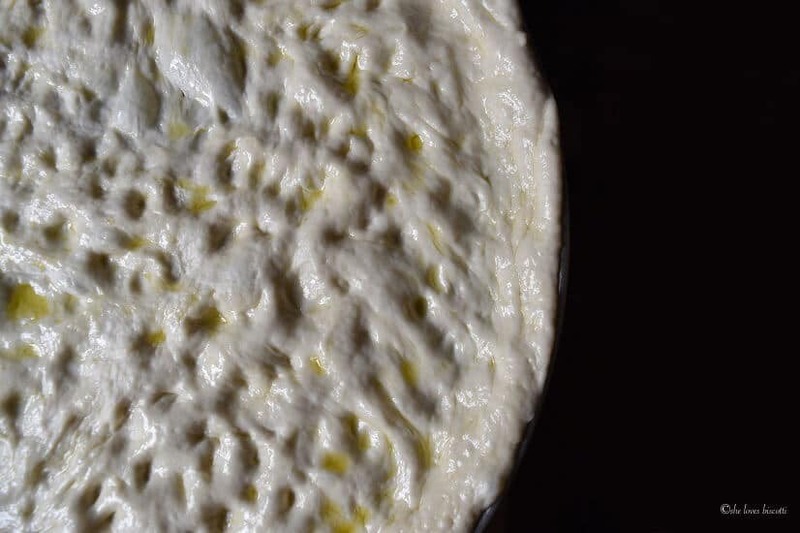 LOVE THIS HOMEMADE PIZZA DOUGH? PIN IT TO YOUR PIZZA BOARD! Can’t wait to try this… the crust looks perfect! Is the pizza dough supposed to be soft and sticky? Or do I need to add a little more flour? After the dough rests in fridge 24 hr. and sits at room temp for 20 min, I then spread in sheet pan but do I let it rise again? I was waiting for this recipe! I can’t wait to try it! I’ll probably triple it. Is it better for the dough to rest in fridge overnight or is it better to freeze the balls right away if I’m not using immediately. I tried the taralli recipe. They came out perfect and I will be making them often. 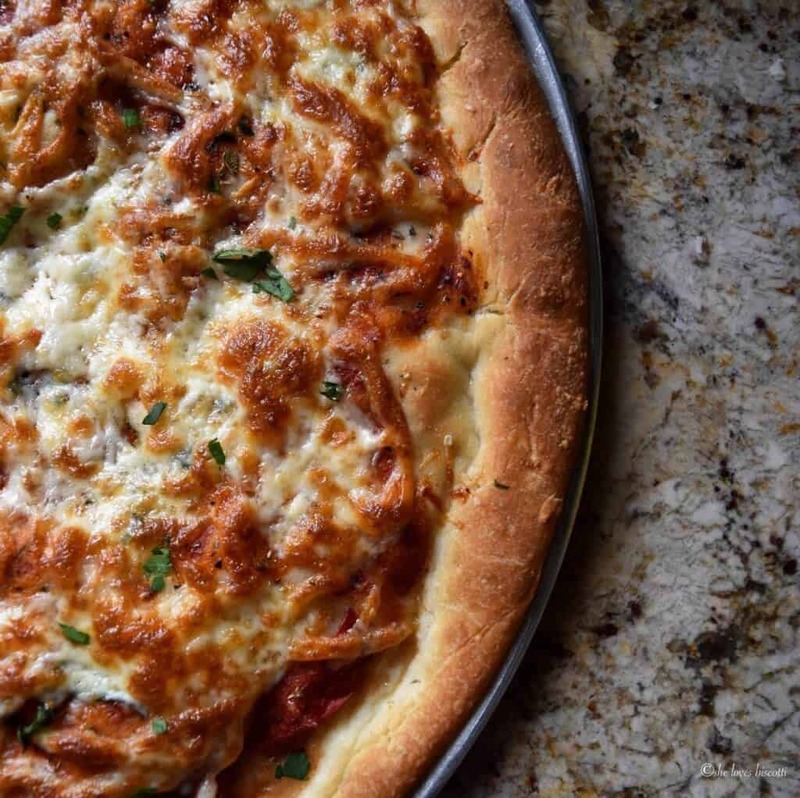 We do have pizza night in our home and your mom’s looks amazing! Have you ever tried it with a different kind of flour? (I try to experiment with gluten-free doughs but have yet to find the perfect combination). Wonderful instructions and great recipe.